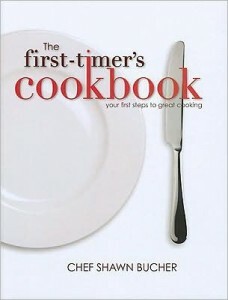 The First-Timer's Cookbook is a MUST for all folks just beginning their own culinary experiences. Chef Shawn has created a book that is sure to help all those heading off to their own destinations in life but lack certain basic kitchen skills. Presented in a clear, consise, step-by-step format, this "cookbook" will enable the reader to know what is required in a basic kitchen, how to use each utensil and what each one is used for as well as, many other numerous tips and tricks that are sure to educate. Unlike most cookbooks, this book is not filled with recipes, but the steps needed to prepare for the recipes. The how-to's for peeling potatoes properly, the different cuts of vegetables, the presentation of the food, yearly vegetable availability and so much more. I am sure even those experienced cooks would find a thing or two that would further aid them in the kitchen. I plan on giving my copy to my 18 year old daughter when she moves out. She has never been one to hang out in the kitchen to watch mom cook and I just know this book will save her a LOT of calls home in frustration over something she is trying to create. This cookbook is a very handy reference book for anyone who cooks and I suggest grabbing yourself a copy, I am quite positive we all know someone who could use such a gift. "The First-Timer's Cookbook is the one cookbook that teaches all the basics. With simple techniques and easy step-by-step instructions for cooking almost anything, now you can learn how to cook, not just what to cook. Easy to follow step-by-step instructions. Lots of descriptive photos. Easy to understand and fun to use." Stopping by from Double Duty Diva's and even though I can cook & love to, I think this is an awesome book. I may purchase it just to see what's inside, there may be some things in there I didn't know about.